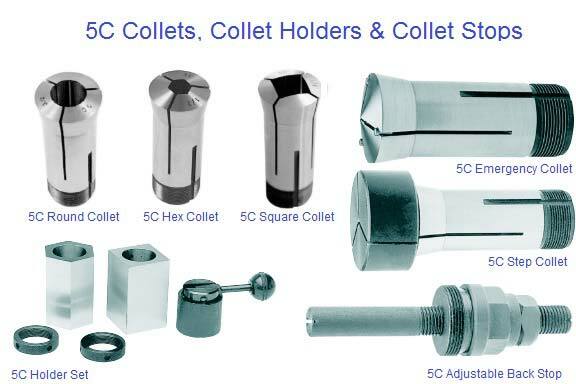 An Extensive Selection of Collets and collet sets and Accessories. CDTooling offers exceptional Precision Quality at an Outstanding Value. A collet (pron. : /'k?l?t/) is a holding device—specifically, a subtype of chuck—that forms a collar around the object to be held and exerts a strong clamping force on the object when it is tightened, usually by means of a tapered outer collar. It may be used to hold a workpiece or a tool. A external collet is a sleeve with a (normally) cylindrical inner surface and a conical outer surface. The collet can be squeezed against a matching taper such that its inner surface contracts to a slightly smaller diameter, squeezing the tool or workpiece whose secure holding is desired. Most often this is achieved with a spring collet, made of spring steel, with one or more kerf cuts along its length to allow it to expand and contract. 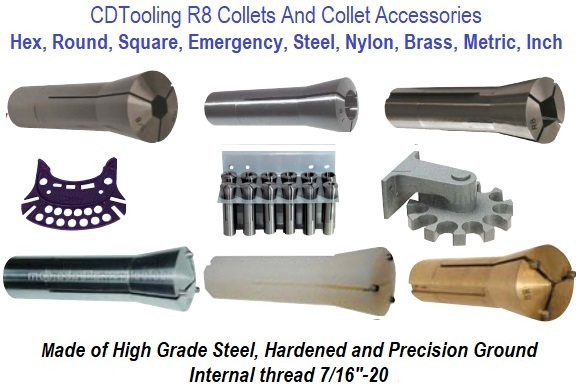 An alternative collet design is one that has several tapered steel blocks (essentially tapered gauge blocks) held in circular position (like the points of a star, or indeed the jaws of a jawed chuck) by a flexible binding medium (typically synthetic or natural rubber). The Jacobs Rubber-Flex brand is a name that most machinists would recognize for this type of collet chuck system. Regardless of the collet design, the operating principle is the same: squeeze the collet against the tool or workpiece to be held, resulting in high static friction. Under correct conditions, it holds quite securely. An internal collet is used to lock two telescoping tubes together. In this case the collet is in the form of a truncated cone drilled and threaded down the centreline. the collet diameter matches the bore of the inner tube, having the larger end slightly greater than the bore while the smaller diameter is slightly less than the bore. A threaded stud, anchored at its other end to the tube, is then used to pull the collet into the tube. The increasing diameter of the collet forces the inner tube to expand and be pushed against the inner wall of the outer tube thus locking the two tubes together. The inner tube is often slotted to facilitate this expansion. Generally, a collet chuck, considered as a unit, consists of a tapered receiving sleeve (often integral with the machine spindle), the collet proper (usually made of spring steel), which is inserted into the receiving sleeve, and (often) a cap that screws over the collet, clamping it via another taper. Usually in shop-floor terminology, the terms collet and chuck are used in contradistinction; users speak of holding a workpiece or tool with either a collet or a chuck. In this context "chuck" means any type of chuck other than a collet chuck (scroll chuck, independent-jaw chuck, etc.). Each collet generally has only a narrow clamping range, which means that a large number of collets are required to hold a given range of materials in the chuck, unlike with many other types of chuck that will generally cover a wide range of sizes. 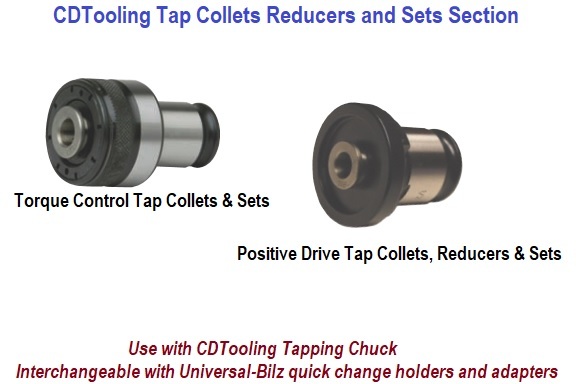 This gives collet chucks the disadvantage of relatively high capital cost. On a wood router (a hand-held or table-mounted power tool used in woodworking), the collet is what holds the bit in place. In the U.S. it is generally for 0.25 or 0.5 inch (6.4 or 13 mm) bits, while in Europe bits are most commonly 6 or 8 mm (0.24 or 0.31 in). The collet is hexagonal on the outside so it can be tightened or loosened with a standard wrench, and has threads on the inside so it can be screwed on to the motor arbor. 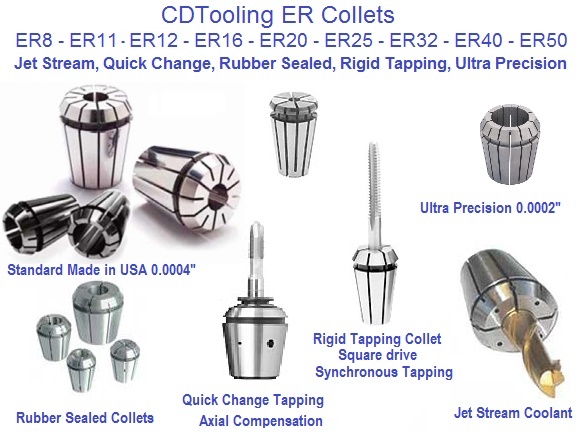 There are dozens of designs of collet used in the metalworking industry. Common industry-standard designs are R8 (internally threaded for manual mills) and 5C (externally threaded for lathes), however there are also proprietary designs which only fit one specific manufacturer's equipment. Collets can range in holding capacity from zero to several inches in diameter. The most common type of collet is one that grips a round bar or tool, but there are collets for square, hexagonal, and other shapes. In addition to the outside-holding collets that are so common, there are collets that are used for holding a part on its inside surface so that it can be machined on its outside surface (basically, akin to an expanding mandrel). Furthermore, it is not uncommon for users to make a custom (bespoke) collet to hold any unusual size or shape of part. 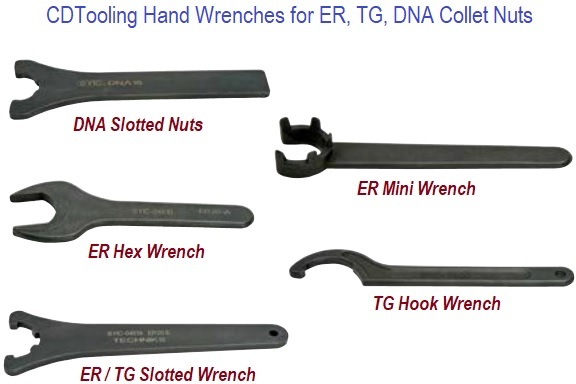 These are often called emergency collets (e-collets) or soft collets (from the fact that they are bought in a soft (non-hardened) machinable state and cut as needed to fit). Yet another type of collet is a step collet, which steps up to a larger diameter from the spindle (analogous to how a mushroom cap is larger than the stem). Step collets allow the holding of rather large workpieces, as long as they need not pass into the spindle through-hole—for example, disc-shaped workpieces. In the accompanying photo, the two top left collets are the side and end view of one style of collet; the two right collets are from a smaller range. The lower image is of a disassembled pin chuck that is used to hold small drills or workpieces. The leftmost part is the body, the collet is shown protruding from the body, and the nose cap is separate, on the right. In use, the part to be held is inserted into the collet, and then the collet is pushed (via a nose cap) or pulled (via a drawbar) fully into the body (which has a taper to match the collet machined into the front). When the nose cap or drawbar is tightened properly, enough force is applied to the collet that the tapers at the front and back of the collet are pushed into their matching tapers, causing the collet to constrict in diameter. This constriction exerts considerable force onto the shank of the workpiece or tool that is being held in the collet. It is then securely held against any forces it may encounter during normal operation. The "ER" collet system, invented and patented by Rego-Fix in 1973, is the most widely used clamping system in the world. ER collets are now available from dozens of companies worldwide. The standard sizes are ER-8, ER-11, ER-16, ER-20, ER-25, ER-32, ER-40, ER-50. The "ER" comes from an existent "E" collet which Rego-Fix modified and appended "R" for "Rego-Fix". The number is the cavity opening diameter in millimeters, which is nearly the outside collet diameter.